Where to begin? Well, it seems that I have adopted a very Barelona life-style already…. eating dinner at 9:00 p.m., having an after dinner drink at midnight, clubbing from 2-4:30 a.m. Okay the clubbing was only 1 night. It was extremely fun, as we VIP’d it with some of Carnet’s colleagues, which meant the best seats in the clubs and wonderful champagne. On Day 6 before the dancing, we went to dinner at Alkimia (http://www.alkimia.cat/eng/home.html), which means “the art” in Arabic and I’m pretty sure “alchemy” in English. 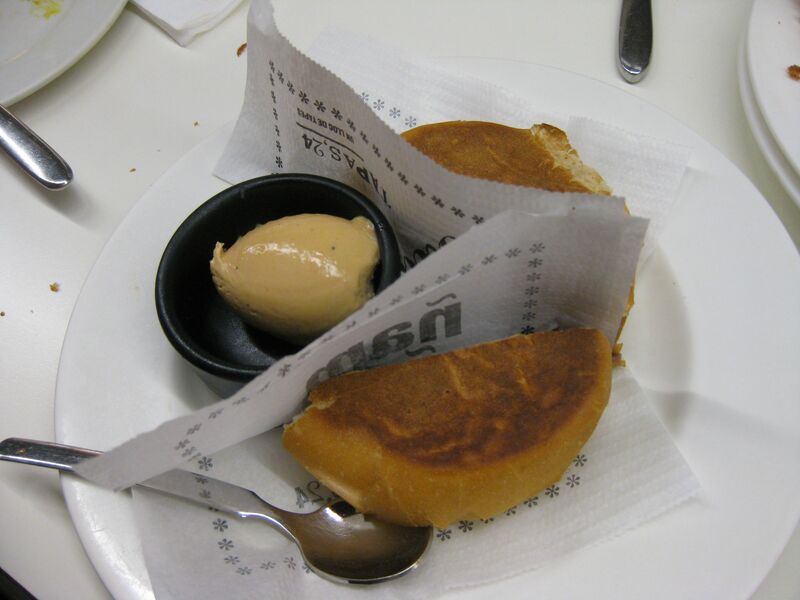 The owner was a disciple of Ferran Adria, and the food was a beautiful reflection of modern Catalan cuisine with some surprises. We had the 7 course tasting menu (the smaller of the two menus), an additional add-on course of black truffles, 6 bottles of wine, and one bottle of alcohol I didn’t recognize but I think was some sort of cider (There were 7 of us dining, so do the math). 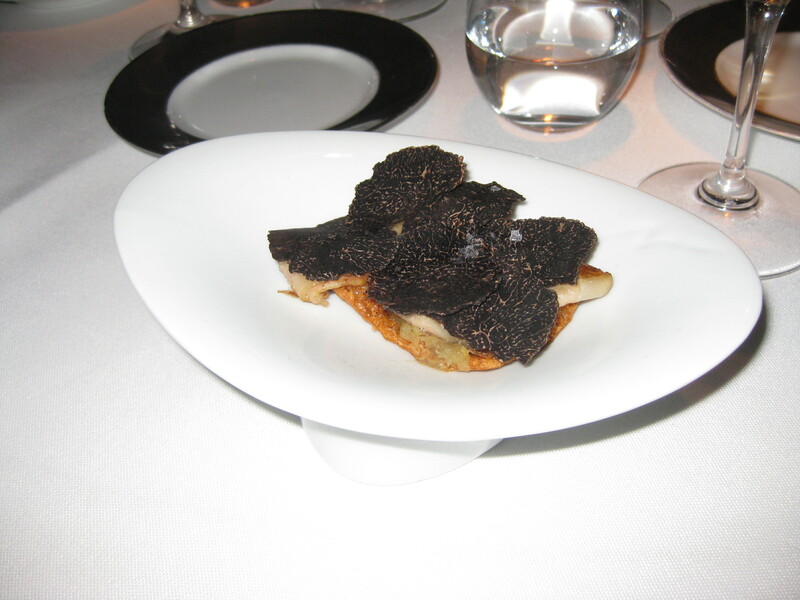 Course 3: bread with pork and black truffles. This was the additional dish we added to the tasting menu and it was the bomb! This is the featured picture at top. 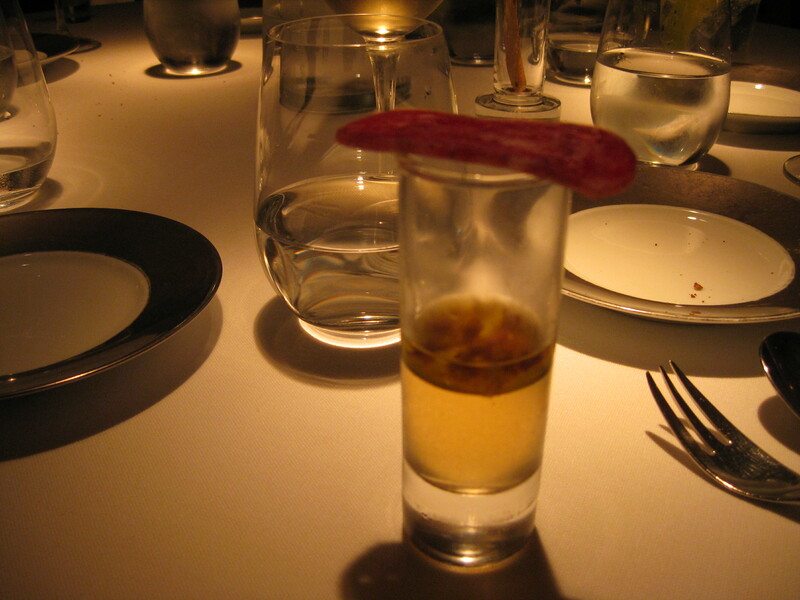 Course 4: Game with artichoke and nectarine surrounded by fat. I’m sure there was a better description than this, but I missed it in Spanish. It kind of reminded me of a foie terrine, just a bit. This dish was truly decadent. 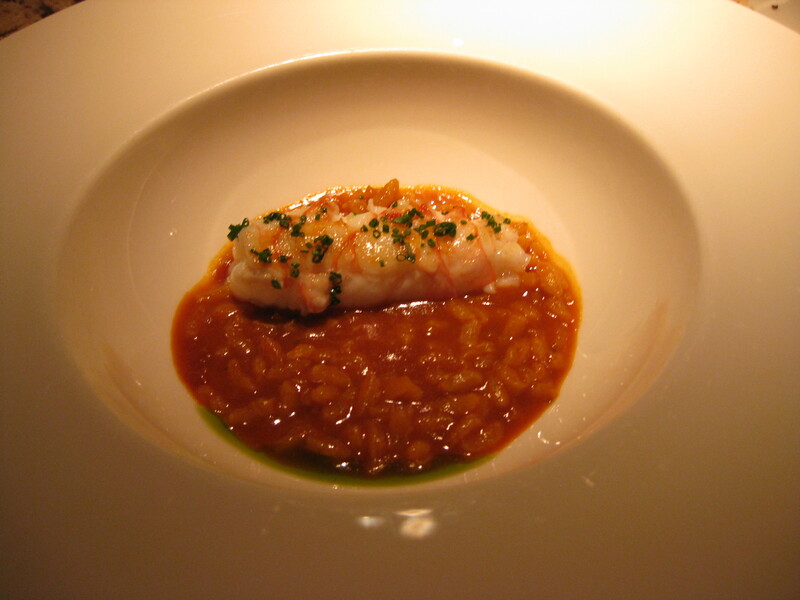 Course 5: Catalan red rice with saffron and langoustine. 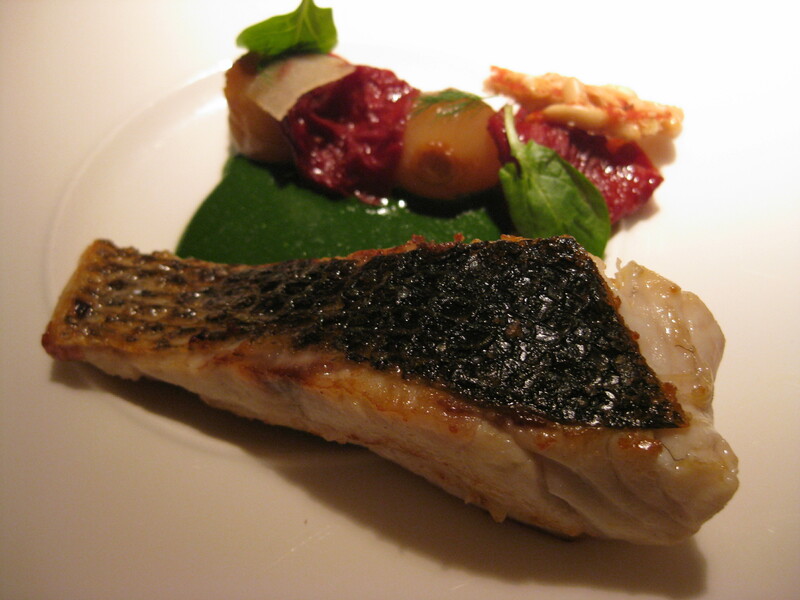 Course 6: Sea bass with spinach cream and a tomato, onion and pine nut crisp. 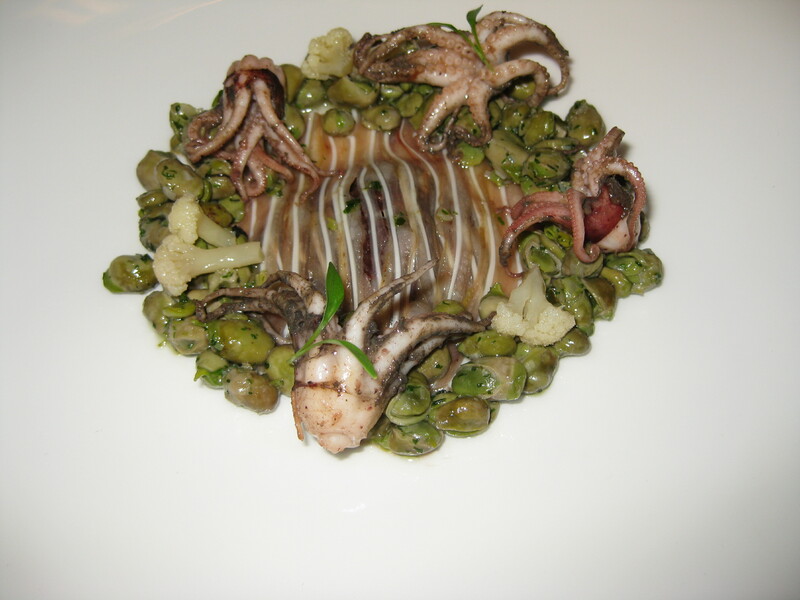 Course 7: blood sausage, pig ear strands, lima beans, octopus, and pickled cauliflower. This was my least favorite dish, mostly because it tasted dirty to me. Carnet said I blew it by not mixing it all together. Instead, I ate the cauliflower and octopus first because they were so delicious. Course 8: Young lamb shoulder with lamb jus, pumpkin cream and radicchio. The item that looks like pasta is pickled pumpkin and the pepitas added a nice contrast in this dish. Desserts (Really, courses 9 and 10): there were 3, but I don’t have a picture of the last one, as I ate it too quickly. The last one was the best: a white chocolate lollipop that housed passionfruit inside. They really like their passion fruit here and I’m glad as I love it. I’ve had it in dishes at 3 different restaurants so far. But, the other 2 desserts were as follows: 1) Glacee with breadfruit, and 2) Eucalyptus ice cream, brownie and quince paste (weird, but if you ate all 3 together, it kind of worked). The 7 of us voted on what were our top favorite dishes. 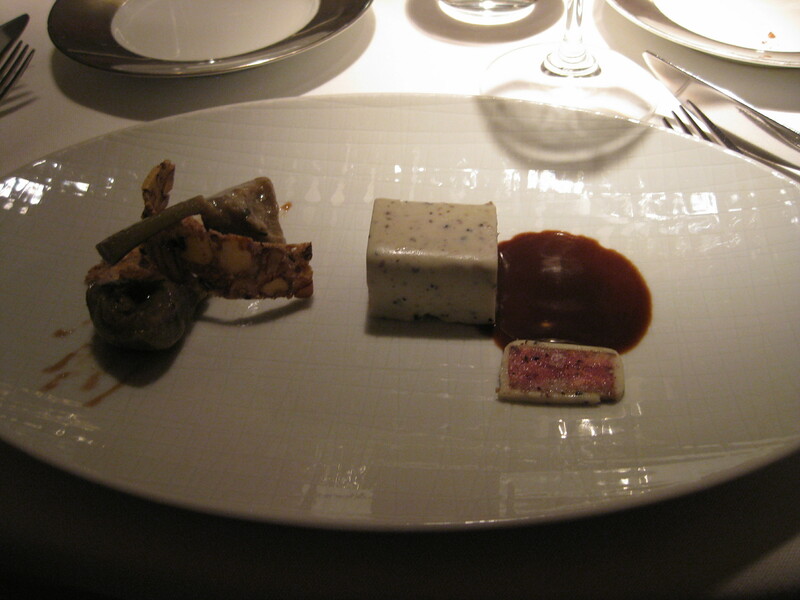 In a first place, 3-way tie were the following: the lamb dish, the tomato bread shot, and the foie terrine. The rice and langoustine was a close second. As if the outstanding food and wine were not enough, my lovely husband got us back into the kitchen and we spoke with the head sous chef. There are 4-5 of them who work in what is a fairly good sized kitchen for not too many people in there. The sous chef was very gracious considering we shut down the place and I’m sure they were exhausted. He and the rest of his staff were very young. I was even MORE impressed after seeing this. Loved: the Japanese-influenced burger on a bao and the shrimp dumplings. Liked: the calamari stir-fry. The calamari was cooked perfectly, as were the vegetables – nice and crunchy with still vibrant colors, topped with dried chili pepper slivers. Item that could have been a success had it not been over-sauced: the snails and shitake mushrooms. Really boring: the mushroom tempura and the lotus root. They had absolutely no taste. They both needed some salt – I mean just any small amount- even though the mushroom tempura was suppose to have yuzu on it. I think they forgot the yuzu, which we speculated would have probably made the tempura soggy anyway. Carnet suggested that had they made the yuzu into a powder and dusted it on the tempura, it would have been nice. I agree; that would have been a great way to preserve the crunch while imparting that nice, subtle flavor to an otherwise boring mushroom. I loved the open kitchen in the dining room. It was really well done, as was the color scheme. I think patrons are really drawn to the open kitchen, as they can see just about everything being cooked/prepared before them. 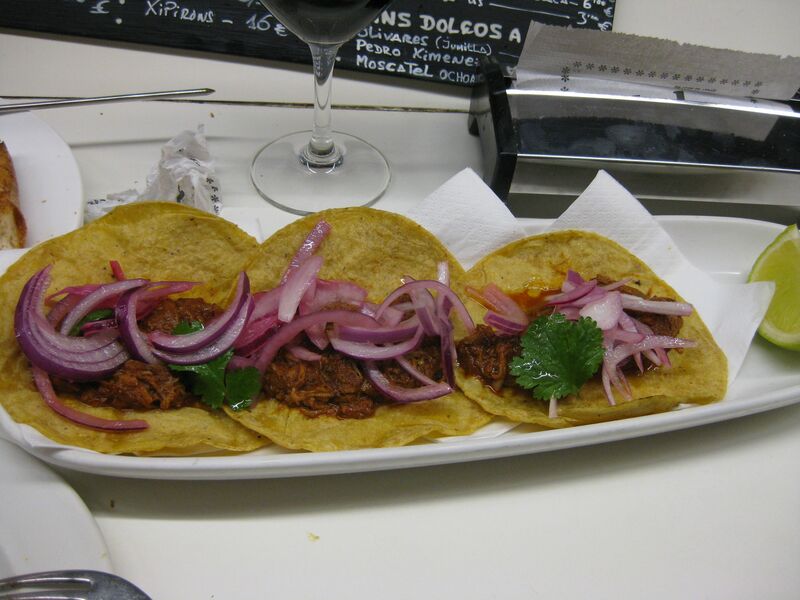 I can see the attraction of Dos Palillos, considering the pedigree of the restaurateur, the beautiful open kitchen, and the fact that the type of food offered is novel in Barcelona. I hope to be more impressed with the food the next time I return. Disclaimer: this critique is coming from someone who has eaten incredible Japanese and Chinese food, so I was going to be pretty hard to please considering foregoing and the price point of the dishes at Dos Palillos. Friday night we went out with our new friend, D.P. 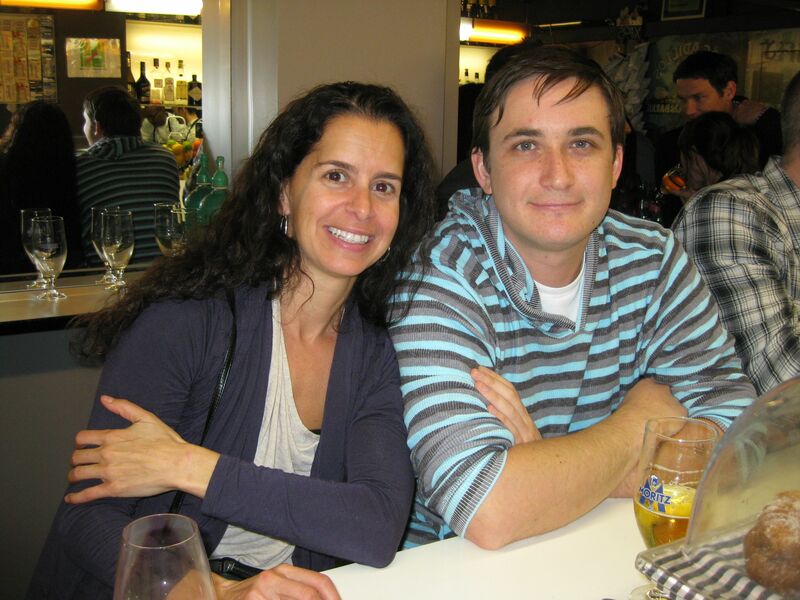 She is a lovely, very intelligent, proud Catalan woman who knows food and social media. 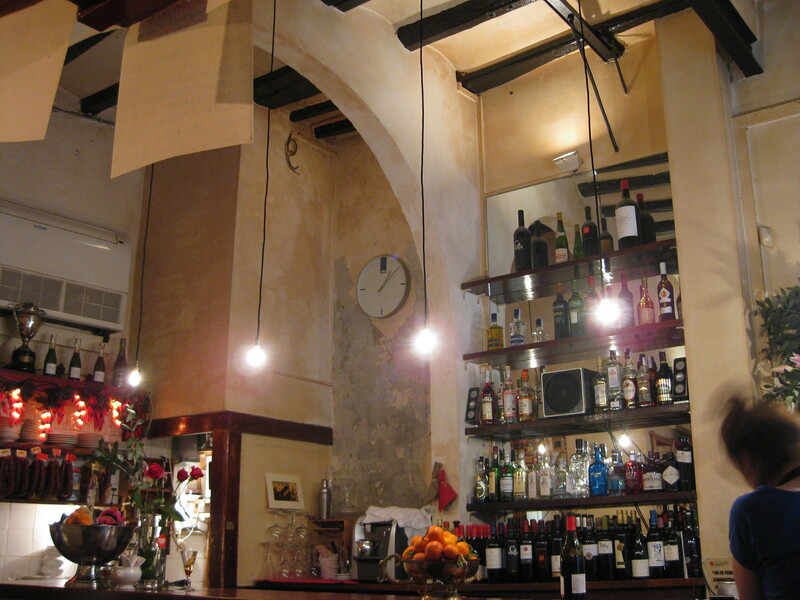 She took us to a darling alley restaurant called La Lluna (2 l’s in Catalan; 1 in Spanish = moon). It was in a historic building. This is a great restaurant to go to if one has dietary restrictions. For each course, the menu says whether it is vegetarian, vegan, gluten-free, and/or celiac-friendly. Here is one pic of dining room. 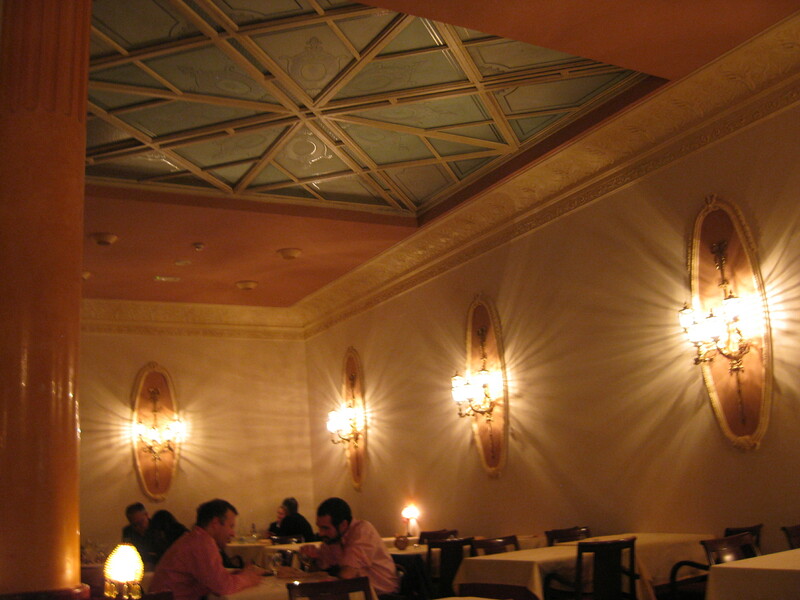 It was very spacious and beautiful, but because of the high ceilings and hard surfaces, it was pretty loud (my usual criticism of many restaurants). 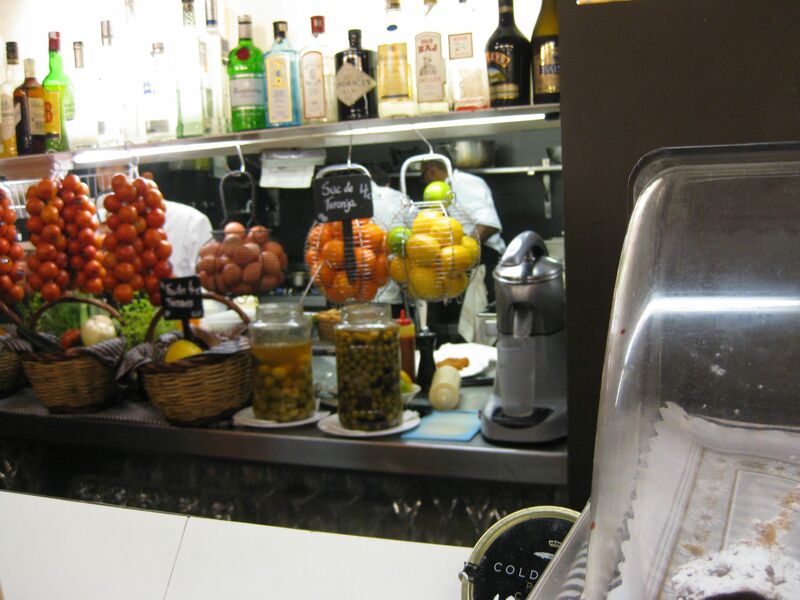 All in all, delicious Catalan food at very reasonable prices. The standouts at dinner were the 2 fish courses and the company. Thanks, D.P., for also taking us to the Picasso and friends hangout. I loved the vibe and the art on the walls. Carnet said he was going to guest post about our Saturday evening at Osmosis, so I won’t say anything about that just yet, other than to say that I love the chef and his staff. No updates for Sunday or today, as I came down with a bit of a cold. So, food is not a top priority at the moment. Stay tuned for more later this week, including a blurb about the microbrewery we found next to our living quarters! 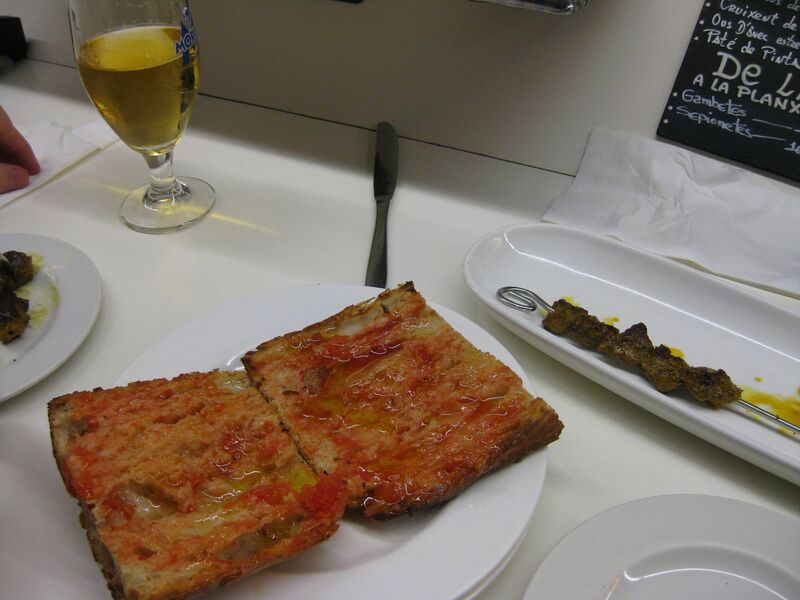 Yesterday I said I would start with tapas from last night, so I will. 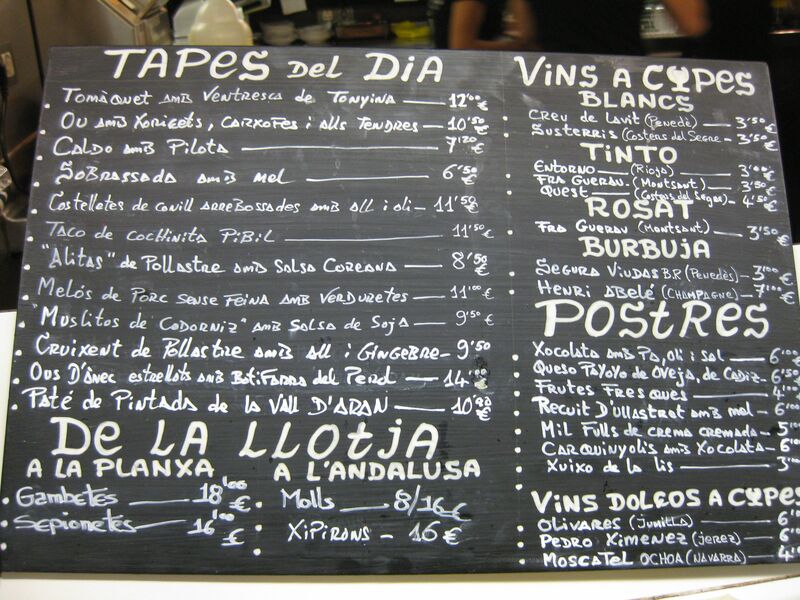 We went to this cute tapas place in an ally that we randomly walked down. It was called El Bixto. No more than 20 seats total, including the ones that weren’t really seats but a piece of plywood covered with material so that it hid presumably empty kegs. It was at Verdaguer I Callis 9. I’m not sure why they have on their calling card: Nos Veras desde el palau de la musica. But, they do. 2) Milhoja de aguacate: aguacate, queso de cabra, cebolla macerada, trujiente de frutos secos, vinagreta de albahaca. I mistakenly thought the first one was a small salad of some sort, but I was very wrong. 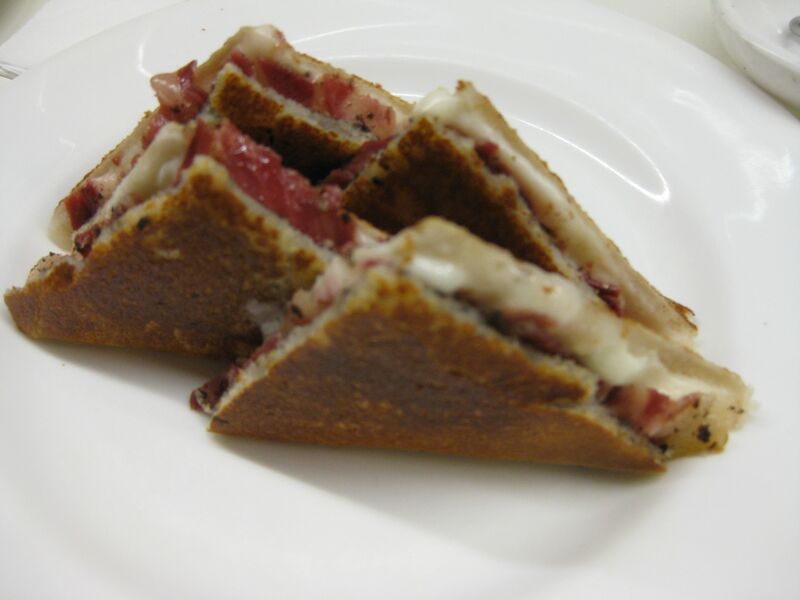 When it came out it looked like refried beans covered with melted cheese and sliced cherry tomatoes. It was served with melba toast. Not that appetizing looking for sure. But, wow what an explosion of the senses. We dipped the melba toast in the ensaladillo (really, it was a dip) and it tasted like ground pecans and jalapeños with melted ementhaler cheese on top. And, indeed it was ground pecans and jalapeños topped with delicious gooey cheese. Whoever thought of this creation was crazy, in a good way. The Milhoja rocked my world. It was a timbal, or terrine of sorts, with avocado, goat cheese, macerated onions in soy sauce, spiced/baked nut brittle, and cucumbers with a thyme-citrus dressing. These people really loved their nuts and so did I. I am definitely going back here. Finally, the dish we asked the server to surprise us with was a typica Catalan dish, as she put it. 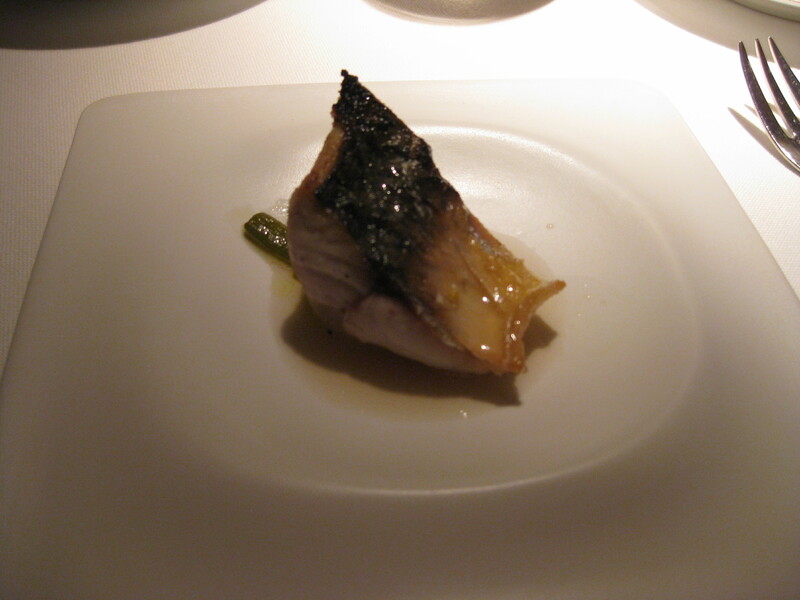 It was some type of white fish escabeche served with a wasabi-mustard whipped dip. Good weird. Kind of like herring with a Japanese twist. I should have taken pictures but we were stared at because we “clearly weren’t from around here” and I felt self-conscious with my bad Spanish. 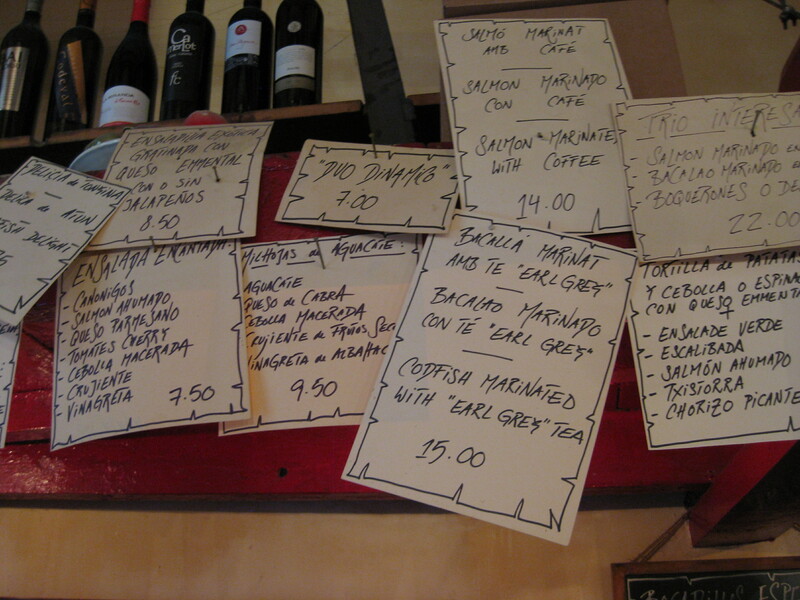 The feature picture at top was tonight’s surprising tapas at a place called Tapas Comerc 24. 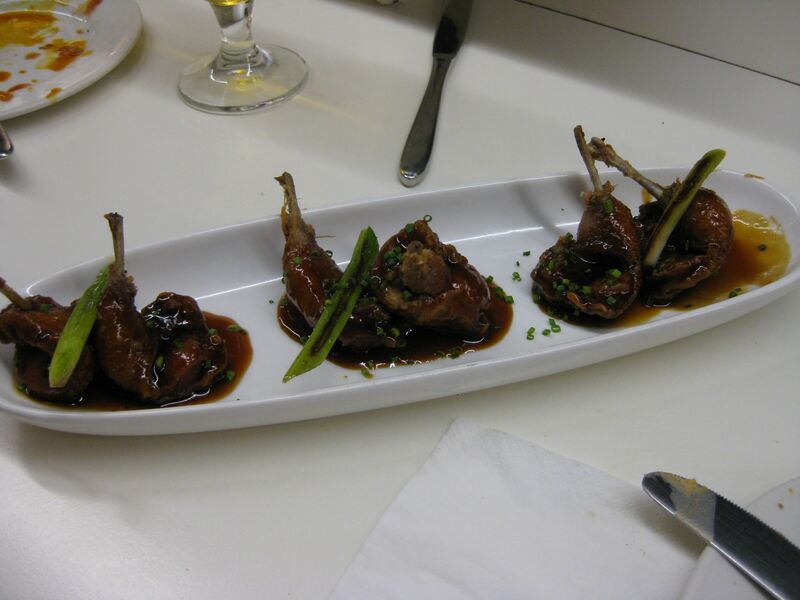 It is very popular in the guide books and the Michelin guide. There was a line, but since we were a party of 2, we were seated in under 15 minutes. Notice to travelers: go in small numbers here and you’ll get in right away. The tacos were awesome. The Mc-Foie burger was served rare, so I didn’t touch it, but the whipped foie gras was excellent. The Lamb skewers had some really nice Indian spices on them, the tomato-olive bread was great except it needed some salt, the squab was WAY too salty but super cute as it was presented, and bikini comerc was as delicious a grilled cheese sandwich as one can imagine. The pictures are all below.